Baking powder is a leavener usually made up of baking soda (sodium bicarbonate), an acid salt (which reacts with moisture or heat, or both – such as tartaric acid, mono-calcium or combination of acid salts), and cornstarch (a filler used to keep the ingredients separated; it also absorbs moisture which prevents premature action). 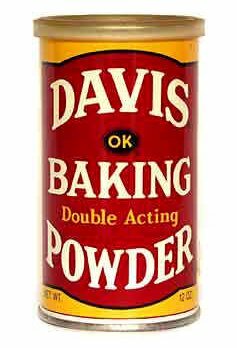 Double-acting baking powder is more common. It contains two acid salts. This means that reacts twice: first when it is combined with a liquid, and then again when heated. It emits carbon dioxide gas each time it reacts, which produces leavening. Single acting baking powder reacts once, when it is mixed with a liquid. The product must be baked immediately after mixing, or you will lose the rising effect. You can make single-acting baking powder by combining cream of tartar with baking soda in a 2:1 ratio (i.e. two teaspoons cream of tartar to one teaspoon baking soda). Once opened, baking powder usually lasts about 6-9 months. To test if baking powder is still good: place a teaspoon of baking powder in a glass of tepid water to see if it fizzes. If it does, it’s still good. It should be stored in a dry place. Do not store in the refrigerator as condensation on the can will ruin it. wow thx sooooooo much this helps alot with my science fair project!!!! yeah this helps with my science fair project tooo 🙂 thanksss . Thanks! Now I’ll get a better mark on my sience project!